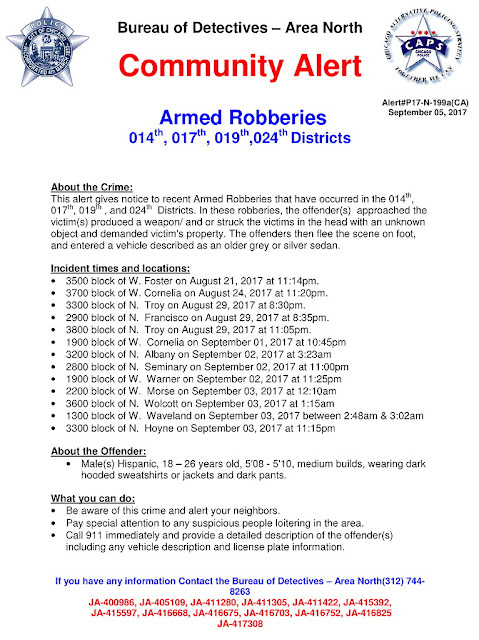 A string of armed robberies across the North Side has (finally) resulted in the release of a Community Alert by Chicago police. From North Park to Wrigleyville to Logan Square, at least 13 victims have been targeted by the violent robbery crew that has been striking people in the head with weapons and pulling guns, police said. The robbers are Hispanic men between 18 and 26-years-old who are using an older model gray or silver sedan, police said. They stand about 5’9” tall, have medium builds, and usually wear dark hoodies or dark jackets. Police included 13 robberies in their alert, but a source said that at least 10 more cases are believed to be connected to the team. • 3500 block of W. Foster on August 21, 2017 at 11:14pm. • 3700 block of W. Cornelia on August 24, 2017 at 11:20pm. • 3300 block of N. Troy on August 29, 2017 at 8:30pm. • 2900 block of N. Francisco on August 29, 2017 at 8:35pm. • 3800 block of N. Troy on August 29, 2017 at 11:05pm.